Applications for the eight franchise slots are also open with forms and the Telekom S-League Licence Agreement available for collection from the Solomon Islands Football Federation (SIFF) headquarters. Applications will close on Friday 13 September so interested clubs are urged to quickly fill in the forms. The eight (8) former clubs with franchise are free to apply but shall do so under the same conditions as any new applicant. The successful applicants will be announced to the public on Friday 20 September after the S-League Board has made its considerations. Due to time constraint, for the 2013 season only, the league competition will be played. However, it will run over two rounds with a total of 56 matches over a 14-week period. Clubs will play each other on a home-and-away basis for a total of 14 matches for each club. 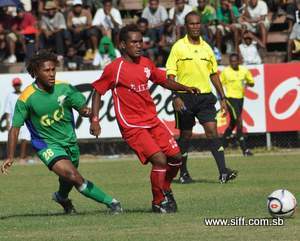 The winner of the league will automatically qualify to represent Solomon Islands in the 2014 Oceania Football Confederation (OFC) Champions League. There will be no finals competition held to determine the representative as was the case in the initial season. The mid-October kickoff means that the 2013 Telekom S-League season will run into 2014 with a conclusion expected in February or March. This should be just in time kick off of the OFC Champions League season. A mid-season break will take place from 15 December to 31 January.